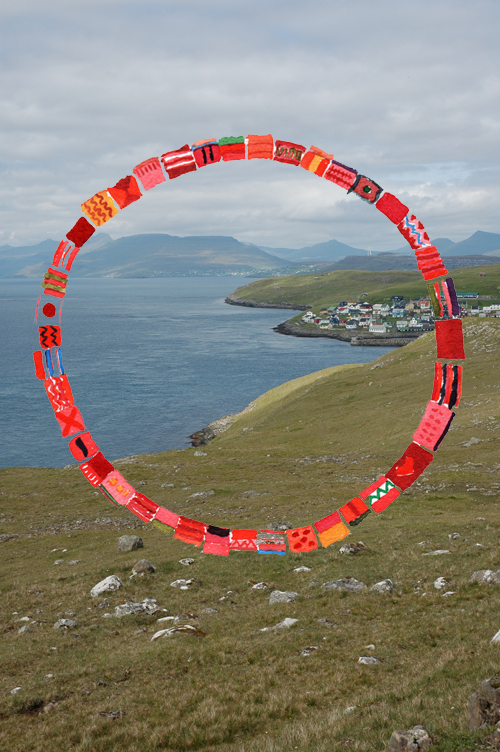 In the summer of 2011, Nordic knitting symposium were planning to be held on the Faroe Islands. The women were invited to participate in a performance entitled "Owning our own time." The knitting will be performed on circular needles No. 4, 60 cm. The task is that each one will create a 25x75 cm large knitting, 150-200 mesh. The dominant color of the knitting should be red. All are encouraged to create their own designs, using yarn from a beloved sweater, talk about their traditions or to produce a red, cheerful greeting. The letters with knittingneedles and instructions were sent to Japan, Korea, Holland, Germany, Denmark, Norway, Finland, Faroe Islands and Sweden. Of the approximately 100 participants in the symposium 75 registerd . How can we see time? Is it possible to connect 100 knitters? ?